and the following additional functions: bake, reheat, broil, bagel, pizza, warm, cookie, roast, frozen. 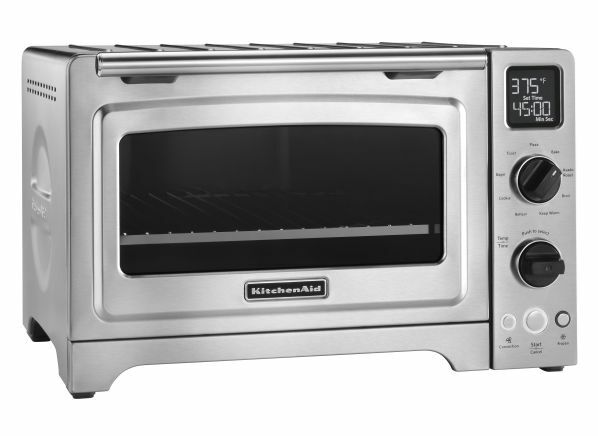 The KitchenAid Digital Convection Countertop KCO273SS is part of the Toaster & Toaster Oven test program at Consumer Reports. In our lab tests, Toaster & Toaster Oven models like the Digital Convection Countertop KCO273SS are rated on multiple criteria, such as those listed below. Reheat: An indication on how well the toaster oven reheats lasagna. Baking: Reflects how evenly each model baked a batch of muffins and cookies. Color range: How well the toasters or toaster ovens produced a range of light to dark toast. Number of slices Number of slices How many slices of toast the toaster oven can hold. Number of rack positions Number of rack positions How many rack positions the toaster oven has. Additional features & accessories Additional features & accessories Any accessories or other features not listed. Convection oven Convection oven Convection mode uses a fan to circulate air during baking or roasting. Controls Controls Indicates the type of controls the toaster oven has. Dimensions (HxWxD) Dimensions The height, width and depth of the toaster oven, in inches. Interior dimensions HxWxD Interior dimensions HxWxD Interior dimension of a toaster oven to the full inch. Additional functions Additional functions Other functions besides toasting such as baking, broiling, proofing, etc. Warranty Warranty The length of time the toaster oven is covered by its manufacturer for defects or repairs.